Price is PER teacup trio. I now have just one trio left available. 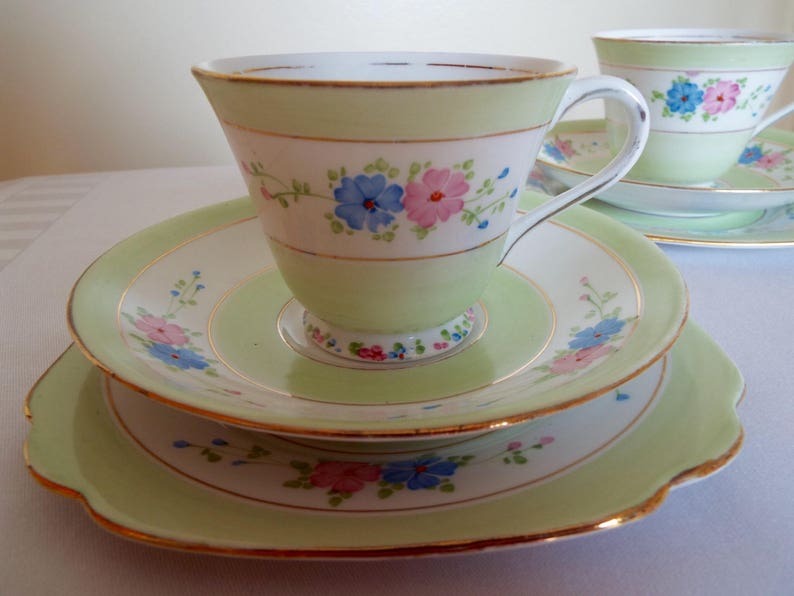 This beautiful pastel green and white trio, with beautiful pink and blue flowers, is exceptionally pretty and entirely hand painted, making it a very special teacup indeed. The pastel green contrasts brilliantly against the bright white china, colourful flowers and gilding. This particulary pretty English trio is by Staffordshire English Pottery Chapmans Longton Ltd, under their Standard China trade mark. This trio has a Standard China mark which dates it to 1916 - 1930, and it probably dates to the 1920s within this period. The beautiful decoration is especially unusual, as there is no transfer print which has been hand painted over. It is entirely hand painted from scratch, including the green pastel colouring. The delicacy and skill of the hand painting is wonderful and the tiny hand painted flowers on the foot of the teacup are particularly unusual, as this is not an area normally hand painted with such detail! The decoration reflects the optimisim of the post-war twenties period, when a teacup like this would have been so uplifting after the austerity of the war years . This tea set would certainly stand out on your tea table and would also display beautifully. A pattern number is hand painted on the underside of the teacup, which appears to be 9107. This trio is perfect as a gift to someone who loves tea and deserves a special teacup. It would also make a wonderful gift for a special occasion such as a wedding, anniversary, birthday or baby shower. The matching large cake serving plate is now sold. This trio is in very good vintage condition. There are no chips or crazing to the glaze. There is some wear to the gilding in places, especially on the teacup rim and handle, which is commensurate with age and use. Any other wear is commensurate with age. Please just ask if you would like any further photos. Please remember this is a vintage trio, not a brand new trio. Your order will be wrapped, at no extra cost, in my pretty standard year round gift wrap, unless you select the Christmas gift wrapping option at the checkout. **Please read my shipping policies before ordering**. I always combine shipping of multiple items ordered wherever possible and I ALWAYS refund any shipping over charges where they arise. Please get in touch if you are considering ordering multiple items and would like a shipping quote before ordering. Beautiful trio. Arrived in great condition.